I chanced upon this book at my sister's place in Kolkata. On inquiring, I found that my brother had left it at her place while shifting places for his job. Now, my brother is not much of a reader and that he was interested in this particular book intrigued me. More over, the past tense in the title of the book made me curious. I was sure, it was going to be an easy read. It is the debut novel of the author, Ravinder Singh. I borrowed this book from my sister and finished it in two sittings! The author tells his love story through this book. It has a tragic end, which explains the past tense of the title. It is the love story of Ravin and Khushi. 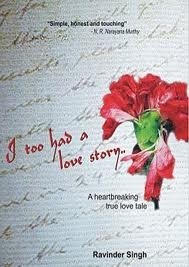 The author tells how he met the girl of her dreams and how their love bloomed. But, things doesn't happen as he had thought as destiny had other plans for them. Giving out more about the story would not do justice to any aspiring readers. So, read the book to find out more. Having said that,I must add that if you are looking for a literary piece than it's not one. If you are looking for a meticulously crafted plot in the story, it doesn't have one. What catches your attention in this book, is the simplicity of the book and the honesty with which the author has written it, and that this story is based on his own love story makes you empathize with the author for having gone through a difficult patch in life. The story is plainly written yet beautifully executed. All emotions conveyed through the story are delivered. It is indeed a touching love story and it did struck a chord in my heart. It is the kind of book I would prefer when I am in a mood for a light read. The author has put his heart and soul in writing this book.It will stay in your mind long after you have read it. TBR-ing this one. I think its supposed to be a huge best-seller and all. i loved reading this book.. worth ..